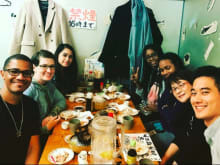 Ninja Food Tours is a group of local foodies based in Tokyo. We take you to hidden gems that only locals know in Tokyo and let you taste great Japanese foods and learn history & culture. We spend a lot of time exploring the city and evaluate local bars and restaurants. The restaurants and bars that you will go to on your tours are highly selected based on our criteria (e.g. food quality, atmosphere, and services). Our tours are 2-3 hour long each and less than $100 all inclusive. Let's eat like a local with Ninja Food Tours! 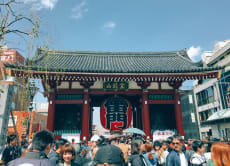 Food and Cultural Tour - Asakusa Food Hunt! Yuma led us on an extensive walking tour of the Shinjuku area. We were able to see unusual things that we wouldn’t have noticed on our own. Among them: Karaoke establishments, pachinko parlors, Shinto shrines, and cram schools. We walked through the Golden Gai and Piss Alley areas, crossing under the railroad tracks from the east to the west. Yuma led us to two out-of-the-way restaurants: a (quite small) okonomiyaki restaurant serving Japanese savory “pancakes” in the Hiroshima style. The next stop was at an “izakaya” - a kind of Japanese deli, where we sampled barbecued skewers. Both places were quite good. As an added treat we ended our tour with a small shop that served green tea ice cream! Yuma was very knowledgable concerning restaurants, the Shinjuku area and Japanese culture in general. He lived in the U.S. for some years so his English is excellent. As an extra bonus he was able to recommend a good sushi restaurant to us and helped us get reservations for the next night!